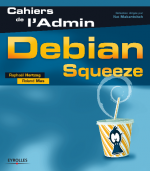 You are here: Home / Action / Do You Want a Free Debian Book? Read This. I cannot say I am personally interested in the English version of this book: as I am French, the French version already suits me. However, I do like this liberation project, but to be honest, what I would love to fund is a liberation of both the French and an English version. This is unfortunately not under my control. But be sure that if the English book is liberated, I will be in a much better position to convince Eyrolles to accept a license change. Right, I shall contribute with that objective in mind. Eyrolles has already published at least one book under a free license, the biography of Richard M. Stallman. Good idea this one-hour mentoring gift. Hope this fundraising will work. I know a French Major who would LOVE to help translate the book – while we cannot donate, we can help. Is there an option to help you translate the book to English? Hello Megsuma, we don’t want too many translators to keep a high consistency in the style, but we can benefit from proofreaders. Please ask him to mail me at raphael@ouaza.com if he’s interested to help.